Editors Note: When Philadelphia was called “The Workshop of the World,” the city’s textile industry was king. By the end of the 19th century 700 companies employing 60,000 men, women and children made everything from carpets to hosiery to suits and dresses. The long decline started as early as 1925, and now, looking at all those boarded up mills in the River Wards, it’s easy to think the industry is extinct. Yet a few companies have managed to survive–and even prosper–none more so than Huntingdon Yarn Mill. 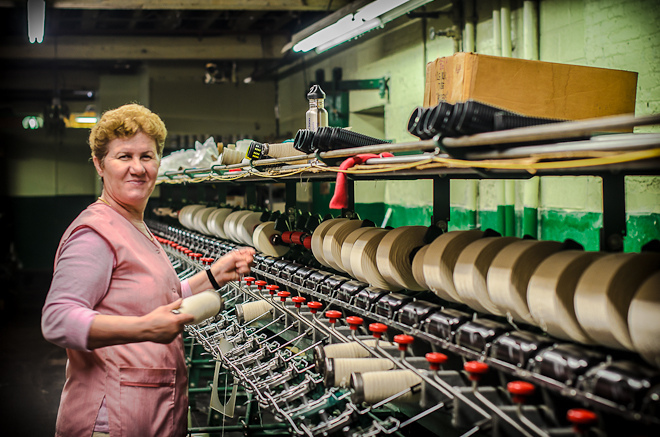 Although the company only dates from the late 1930s, it has succeeded thanks to vintage machines that can produce higher quality yarn, and the specialized knowledge of how to run them that’s been passed down through generations of workers. Theresa Stigale and Peter Woodall toured the plant and spoke with owners Majid and Fay Jaraha about what it takes to keep a business alive in a shrinking market. 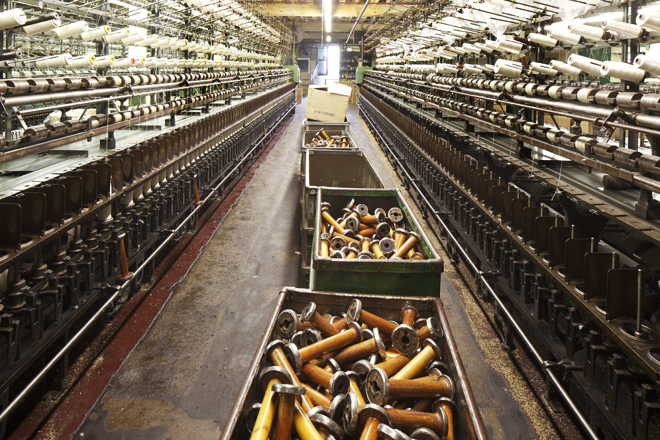 Peter Woodall: What types of yarns do you manufacture at Huntingdon Mill? Majid Jaraha: We make all types of novelty yarns using natural fibers as well as silk, linen, and rayon. One of our new lines is called Florafil, a high quality yarn in vibrant colors used for hand-knitting. We promote that on a website called MadeinAmericayarns.com, which is separate from our main website, HYMill.com. 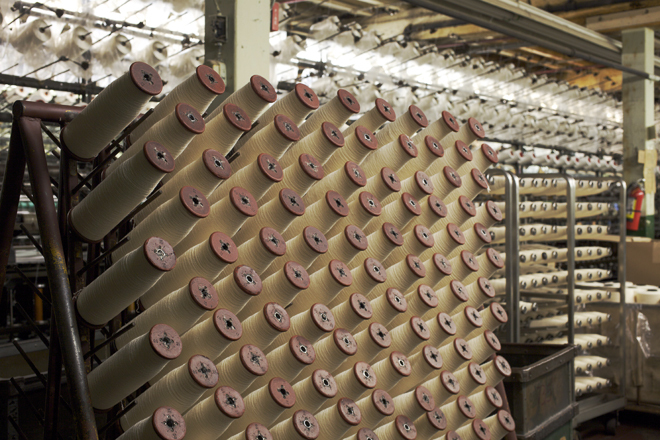 PW: So how in the world did you end up owning a yarn mill in Port Richmond? MJ: I came to the U.S. from England 27 years ago, after earning a degree in textile engineering. This was my second job in the U.S. I started at Rose Mills, then became a purchasing agent here at Huntingdon Mills and worked my way up. Rose Mills closed because they couldn’t find anyone to run the company. I was fortunate to work for Robert Birkenbach (at Huntingdon), who was a second generation owner, his father was George Arthur Birkenbach, who started the mill back in the 1930s. Bob was a true textile person, a genius. He was old school, he worked on handshake deals. If he told you that he would do something, he did it, he was very honorable. I still keep Bob’s desk in the office, in the same spot. PW: The economics of the textile industry have sure changed in the past fifty years. MJ: Absolutely. We have a niche market here, we are not in the commodity textile market like the big mills in China. We can actually survive and grow at this scale because we have diversified our yarns for three main markets: home furnishings, apparel, and the craft industry for hand knitting. We can compete with some of the imports because we cater to the very high end of the market and can make all types of specialty yarns on demand. 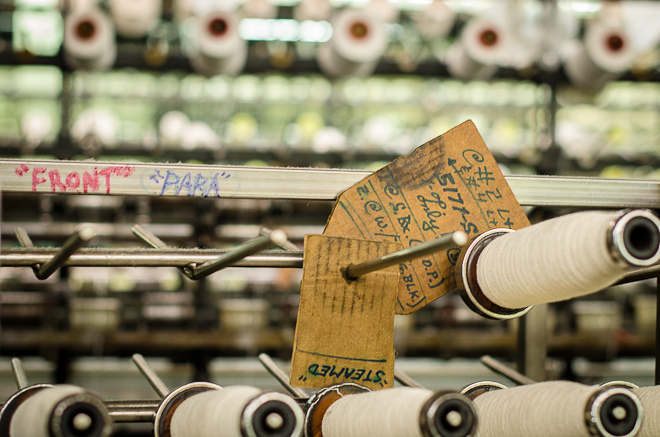 The buyers of bulk, imported yarns from oversees give up quality for price. PW: Some of your customers are designers in New York. Can you share some names? FJ: We have sold to Ralph Lauren and have sent samples upon request to Liz Claiborne and Eileen Fisher. Some of the designers are now committing to buy at least 20-25% of their raw materials in the U.S; their customers are demanding it. They can advertise “Made in America” and also have the benefit of selling a higher quality garment, using our yarns. Also If they buy from us instead of oversees, we can solve problems very quickly for them. With imports, any mistakes would cost a lot of money to ship back and forth to China, it takes much longer to resolve an issue. We can respond right away and even pay them a visit because we are relatively local. Ironically, some of yarns end up being shipped over to China for use in fabrics, which then get shipped back here. PW: What can you tell us about your equipment? MJ: Well most of it is original, and we found that in order to produce the higher quality yarns that we needed to keep the older machines, rather than buying anything new. We actually bought some older used equipment from Canada and custom built a new building across the street to accommodate it, instead of the other way around. PW: Are there still skilled workers left over from, say, the 1980s, when more mills were still in business? MJ: Not really. It becomes the biggest challenge to find new workers who have expertise, and we are not only talking about the textile industry, it applies to all manufacturing. It can take anywhere from a few weeks to up to six months to properly train a worker on these machines, sometimes years. We are lucky to have so many long-time and loyal employees. 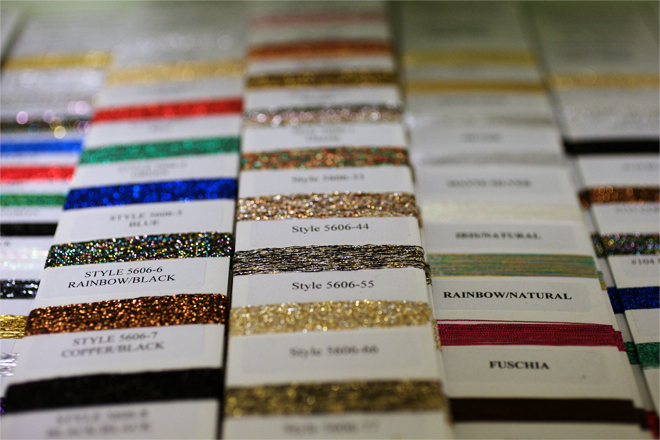 Jesse Piselli, production manager: All the classes in the world can’t teach you novelty fabrics. They’re 20 percent engineering, 80 percent art. PW: Historically, textile mills were often located next to dye mills, is that the case here? MJ: We used to send our yarns to outside dye houses but a lot of them were shutting their doors so we had to set up our own dye house here. My wife Fay joined us three years ago to work on marketing and attracting more business from the fashion and apparel industries, she has a background in fashion design and pattern making. 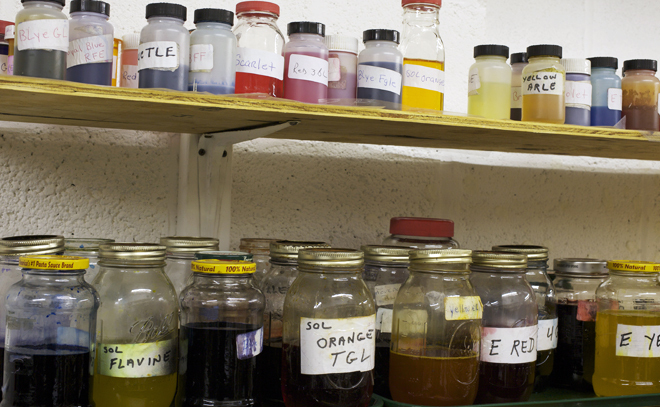 She also spends a lot of time in the dye lab working on color formulas for new yarns. PW: How do you get the color exactly right for a customer? FJ: Customers send us a sample of a piece of fabric or yarn, the computer “reads” the sample and creates a formula. Then we adjust the ratio of water to dye to ensure the most exact match possible. We work with a lot of very high end natural fibers. Our methods to dye these yarns are slow and expensive but they introduce the very best quality for the customer. Theresa Stigale: What do “twisters” and “winders” do? Sounds like some fun dance moves! 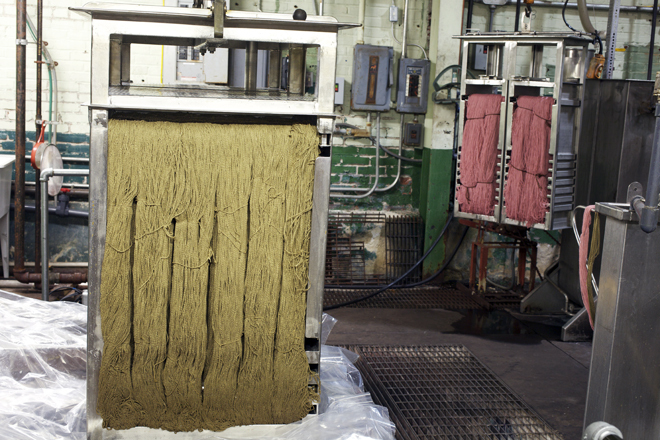 FJ: A twister works on the yarn in the early stage of production and takes the “roving,” a type of woven wool, into the machines that stretch and pull the yarn onto wooden bobbins. The winders are the machine operators that transfer the yarns from the heavier wooden bobbins onto a new core, either paper cones or tubes, for lighter transport. Each fabric manufacturer needs a certain size cone or tube that fits on their own machines, it also has to be a certain weight. Natasha is our head winder and can operate three machines at once. TS: What keeps you and your company here in Philadelphia? MJ: Realistically, there are several factors. First of all, there is a real sense of community. We have fifty local employees and it is very important to us to keep them working. Also, the size of the equipment is huge. The company has been here for approximately seventy years so it’s not possible to just pick up and leave, nor do we want to. The city is really changing for the better compared to when we arrived here in the 1980s. We love Philly! Because we have always been a family-run business, one of the most interesting things about the mill is that up until five or six years ago, we had three generations all working in the mill together. Our right-hand person is Barbara, the office manager. Her mother Loretta, worked in the mill for fifty years. Even though she retired a few years ago, she still comes around to check in on us to make sure that we are all OK.
Great story Theresa! So wonderful and unexpected. I own a textile mill in Kensington, that used to make similar products, and in the 19th century, carpets. I truly thought that none of the mills were still working. You have made my day, my month, my year. Hats off to this company for staying in the city and hiring local. Great example for all of us. I second Jesse Gardner’s commentary above! Absolutely delighted to read this article!!! Especially given that I took a trip down to a closed silk mill in Lonaconing, Maryland back in February. (Called the Lonaconing Silk Mill.) I’m a photography enthusiast who finds capturing historical – and sometimes sadly – abandoned sites, especially those related to the Industrial Revolution. I am well aware of Kensington’s role during this economic growth period for our nation. It has particular emotional connections for me as many of my ancestors worked in these mills as well as places like Cramp Shipyard, etc. All this being said, I’m going to check Theresa’s Flickr page. 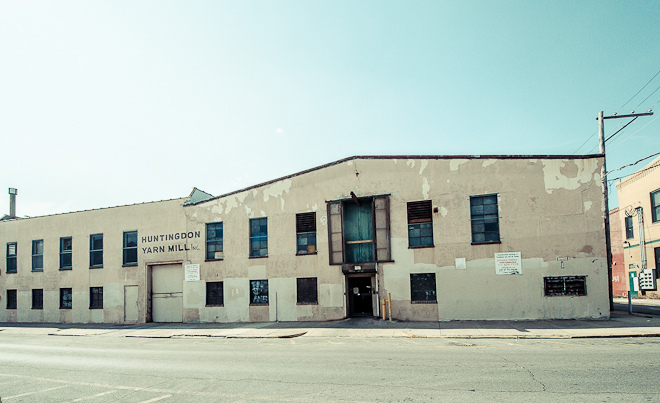 I would LOVE to visit Huntington…the photos you posted featuring the machinery, etc. are almost identical to those at Lonaconing!!! Is this possible? Thank you very much Kate! That’s really interesting to hear about your connection to the industry. I would love to see your photos of the silk mill if they are publicly available and would be very curious to see if the equipment is similar– I would venture to say yes! My flickr page has other photos that were taken on the same visit. Thanks again for your comments. Thank you Jesse! That’s amazing that you own a textile mill and so close by to this location! I’m very happy to know that you love the story. The owners do appreciate their experienced workforce and the sense of community amongst everyone there is very real. Thanks again Jesse and appreciate your comments. This is so nice to hear about. And wow, their site is handsome too. WOW,I stumble across this story while looking for old photos of yarn twister in Philly, its a great story but was a little disappointed thatt Jesse didn’t mention my mother who been twisting yarn WAYYYYY before the 80’s and is still there.